Seems that Jody Tucker of Kansas City has also ventured into the world of blogging about Boy Scout memorabilia collecting. At this writing, there are only two short posts, one on the Dallas TOR and the other on a potential Osage X3. Several days ago, I posted on a Patch-collecting blog I ran across Bob McCanless' The Patch Blanket at http://www.patchblanket.blogspot.com/. There is also a webisite http://www.patchblanket.com/. This site appears to be more of a combination of a blog and forums. The webmaster of the site is Jason Spangler. The front page has several recent posts on a variety of collecting topics. These seem to be individual messages from the various forums. Currently there are about 15 forums and 40 registerd members. Give them a look. Below is a copy of a flyer for those looking to purchase one or more of these patches. The Red mylar border patch will be the X42. It is the same as the X41, but a RMY border and Arrow. Update to Previous Post - Unlisted 417 Neckechief? In a previous post, I speculated on whether a neckerchief I had acquired was a Section Conclave Issue or on unlisted Lodge Contingent item to that conclave. I did have a couple of responses, Dave Scocca wrote "The Conclave Handbook Volume 1 (Frank Dingwerth and Chris Jensen) pictures this neckerchief as the Area 2H issue for 1959. The checklist indicates that a neckerchief (but no patch) was issued." Separately Jim Clough had a number of 2-H Conclave items in his last sales list. The pictured neckerchief was listed as the 59 2-H Conclave Neckerchief. This was the earliest conclave item from 2-H in his list. I have not had any direct repsonses from any 2-H members or collectors. While it is likely this is a conclave piece, I will continue to look since the previous 2-H Conclave issues (1956-58)and post (1960 and later) all specifically mention "conclave" on the neckerchief, only the 1959 does not. Time will tell. 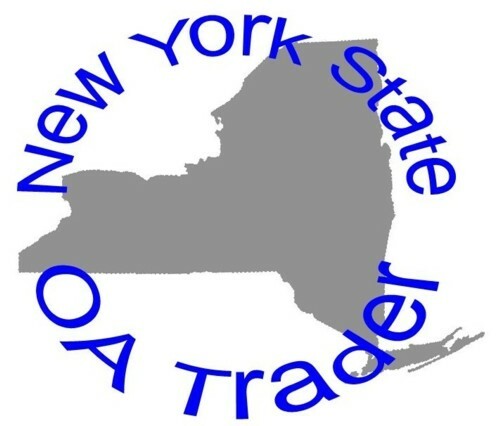 Roy More of TSPA (The Scout Patch Auction) also has a blog on items of interest to collectors in many areas. 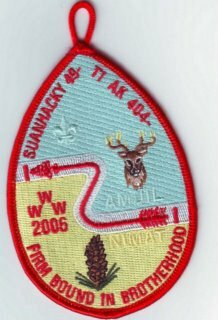 Recent posts include: Ken Kittleberger's Baden-Powell Collection, an Early Camp Wauwepex felt patch, Silkscreen lodge neckerchiefs are hot (a post on a recent eBay Auction for a Lodge 61 silkscreened neckerchief which sold for over $1000.00) and Commissioner Arrowhead Award documentation. The blog archives go back to 2003 and can be accessed here. Bob McCanless, a collector currently in the Pittsburg area and member of Patch-L, has recently started a patch collecting blog called "The Patch Blanket." As he describes it; "A home for BSA patch collectors, tall tale spinners, and Red Jackets of ALL ages! Come on in - the cracker barrel NEVER ends!" The blog seems to have started 6 weeks or so ago and covers a wide range of topics both collecting related and not. The posts I've read, have been interesting. Give it a try. 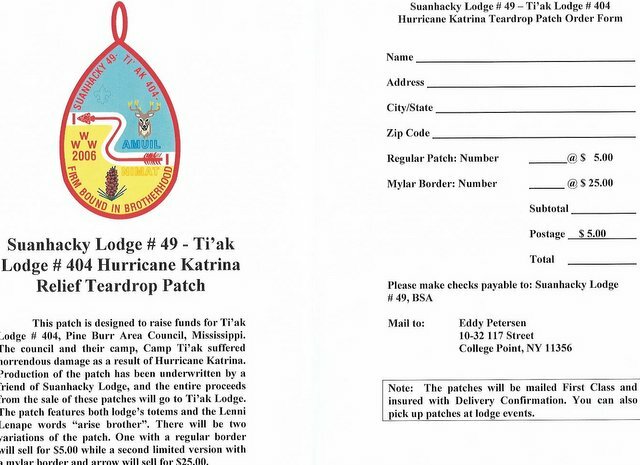 Suanhacky Lodge #49 has issued a patch "designed to raise funds for TI'ak Lodge #404, Pine Burr Council, Mississippi. The Council and their Camp Ti'ak suffered horrendous damageas a result of Hurricane Katrina." The cost of the patch has been underwritten, so the entire proceeds from the sale of these patches will go to Ti'ak Lodge. Their are to be two varieties, a regular version and a limted version with a mylar border. I will try to get a link to the form, but in the interim, you can click on the lower image. 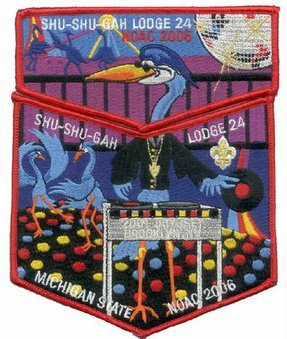 Suanhacky Lodge #49 issued an Executive Board flap the later part of 2005. Not sure the exact critieria, but they come with a numbered certificate "#X of 100". 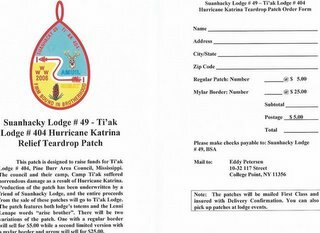 Shu Shu Gah Lodge has isssued a fundraiser set for the 2006 NOAC. "Return to the days of disco fever and the legendary Brooklyn night club “Odyssey 2001” with this flap set issued for the 2006 National Order of the Arrow Conference." A Flyer to order the sets can be found on the lodge website.